But I also re-read my favourite books quite a lot. Partly I do it because it’s relaxing to read something familiar. Partly I do it because even if I’ve read those books more than once (or twice or ten times…) I always discover something new in them. One thing all the books I like to re-read have in common, is that I enjoy the language in them (IE the way they are written) just as much as the story itself. These are some of the books I can, and have, re-read more times than I know and I still enjoy whenever I pick them up. The Lord of the Rings trilogy – If you know me, you probably knew this would be top of the heap. I read the books for the first time when I was in my early teens and it quite literally blew my mind. My world has never been the same since. I remember lying in bed after a marathon session of reading “The Return of the King”, crying my eyes out because the story was over and there was no more to read. I usually re-read the trilogy once a year just to go back to Middle Earth. The Martian Chronicles – This is a classic collection of short stories by Ray Bradbury, and it made a huge impression on me when I was a teen. I don’t think I’d realized before reading it, that it was possible to write a collection of short stories that actually fit together. Kind of like a theme album (as in music, on vinyl). The Martian Chronicles is old-school sci-fi, and yes, the technology in the stories is dated, but that doesn’t really matter since Bradbury’s stories are never really about the technology anyway. The Waste Land – This long poem by TS Eliot was another piece of literature that blew my mind when I first read it as a teen. That poetry could be like this: strange, sprawling, yet oddly compelling even when I couldn’t always understand immediately what it meant, was a revelation. It was like a world in itself, with all these various layers of meaning, shifting rhythms, dialogue blending with descriptive passages and literary quotes. I still find it completely mesmerizing. Foucault’s Pendulum – Umberto Eco is a genius, and I think this is his best book. It is the perfect rebuttal to the ridiculously overblown and over-hyped conspiracy theories of Dan Brown’s books and the atrocious Holy Blood, Holy Grail. And best of all: it was written years before those books became popular! In the book, Eco guts and skewers that whole genre of writing and the flawed way of thinking that goes with it. And he does it with a fantastical, mesmerizing tale of three Italian book editors. (Told you he’s a genius.) To paraphrase his point: Just because you can fit pieces of actual history into some fictional scenario you’ve dreamed up, doesn’t mean that the story you invented is true. But as long as you act as if there is some super-ultra-secret knowledge that only you have figured out, then some people will probably believe you. Tinker Tailor Soldier Spy & Smiley’s People– John LeCarré is brilliant. I think he writes some of the best characters and dialogue of any writer, ever, in any genre. And I also think these two books are his masterpieces. I’ve read them so many times my copies are falling apart. The Count of Monte Cristo – This is the ultimate, ultimate revenge tale. Seriously. The Bride from Kill Bill has nothing on The Count when it comes to single-minded, devious ways to exact revenge. My copy of this book is in Swedish, and it’s from 1899 or something: I found it in a used book store and it is divine. I just wish that one day, someone would make the actual story from the book into a movie, not some watered down version. Colleen McCullough’s Masters of Rome books – The first three books in this series are crazy-good reading: the kind where you can barely put the book down to eat or sleep. The rest of the series is also excellent, but I think her heart was really, really in the very first books about Gaius Marius and Sulla. She obviously loves Caesar as well (and when reading her books, it’s hard for the reader not to). The books are a great take on the Roman world. They are set in Republican Rome, just as it is on the cusp of becoming Imperial Rome, and blend romance, vendettas, politics, well-researched historical detail, accounts of military campaigns and war and a huge list of characters (fictional and not) into an amazing story. It is the best way ever to learn about ancient Rome. The Odyssey & The Iliad – It’s Homer. It’s ancient. And it is so. damn. good. No, really. Ultra violent, gory, over the top in every way, strange and familiar… It’s like a sprawling, epic Hollywood blockbuster with better language (except Hollywood is apparently unable to do it justice). How anyone could have written this 3000 years ago (or so) is amazing to me. 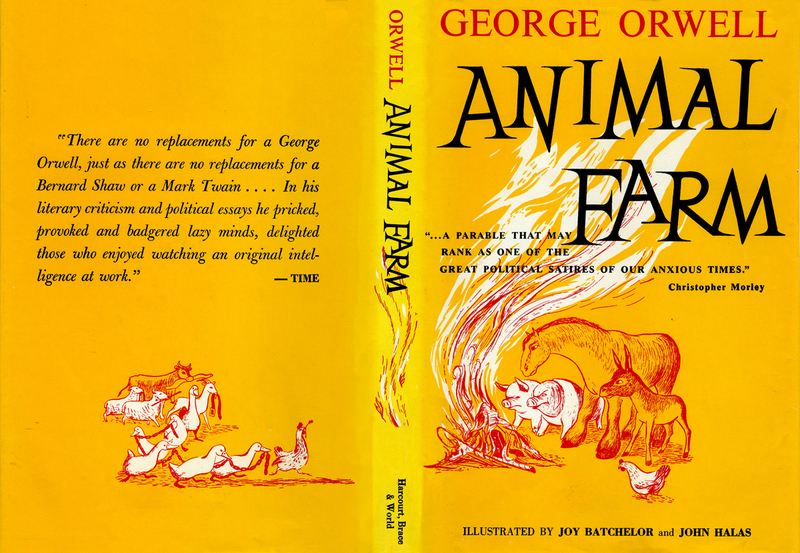 Anything by George Orwell – If I could write like another writer, which I know is really not possible or something I should want, I’d want to write like Orwell. I love everything he has ever written: novels, articles, essays… doesn’t matter. Love this! I too, can’t really get past the Odyssey. If you’re ever interested in some great book reviews and musings, be sure to follow! Thanks!!! I should steal Dad’s copy of TTSS, it’s a long overdue read. Masters of Rome sounds like something that needs swift adding to the to-read pile! The Master of Rome is so awesome. McCullough’s love for Marius and especially Sulla (and later Caesar) really gives it heart and soul.